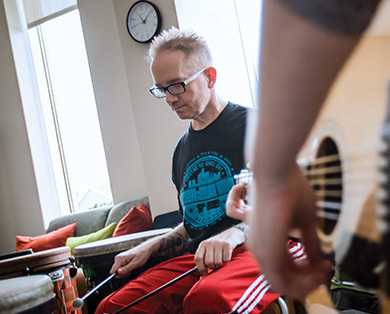 It’s not unusual to see patients at the Stephen and Sandra Sheller 11th Street Family Health Services Center practicing guided mindfulness exercises in the waiting room. The staff use these techniques to prepare patients to be responsive to the center’s innovative, nationally recognized model of nurse-led, community based care, which treats the whole person by integrating primary care, behavioral health, dental care, and wellness programs. The center is a true community partnership, one that has only strengthened since it opened in 1996 to serve the residents of the 11th Street corridor in North Philadelphia. Many of the people treated at the center face significant health and financial challenges stemming from tough childhoods. Almost 50 percent of the patients at 11th Street have reported four or more adverse childhood experiences, such as physical abuse or neglect. Using trauma-informed care to shift the focus from what’s wrong with a person to what’s happened to a person, the staff embrace innovation to create a culture of health and healing. In collaboration with the center’s community advisory board, they work directly with the people they serve to develop new services and programs aimed at building strong, resilient families across the lifespan. 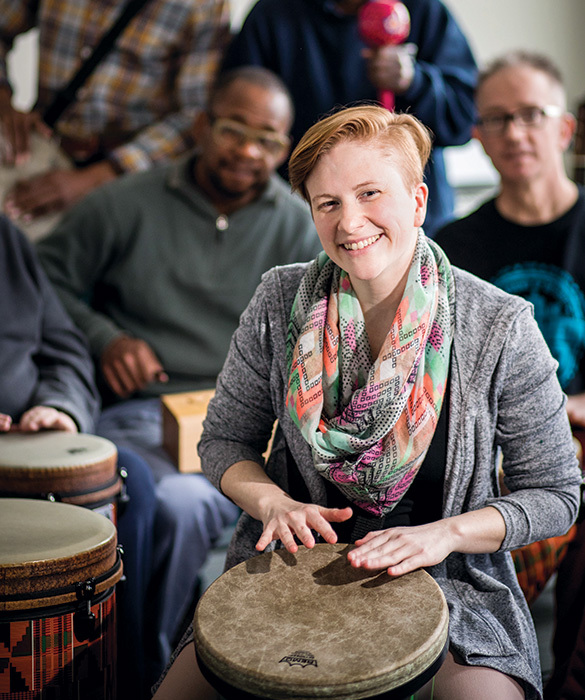 Targeted funding from our Foundation is being used to continue to offer therapist-led Creative Arts Therapies (CATs) at the center, including dance/movement, music, and art. Research shows CATs can have life-changing effects by helping people who have experienced trauma work through psychological issues to accomplish their health and well-being goals. The center offers other key services that are not typically integrated into primary care, including yoga, fitness, nutrition, cooking, and mind body stress reduction classes. The pressure to do more with fewer resources can put additional stress on health care professionals. With our Foundation capacity funding, the center is providing training to staff at all levels to help them learn how to manage their own stress, be more present, and champion the trauma-informed model of care to ensure positive outcomes for their patients. Supporting the work of community health centers like 11th Street is vital to transforming the delivery of health care for all. 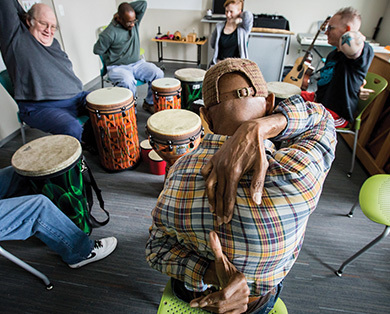 Community members participate in a drum circle, one of the Creative Arts Therapies groups provided at the center. Blue Safety Net grants supported 44 nonprofit, private community health centers that provide affordable, quality health care in underserved communities.